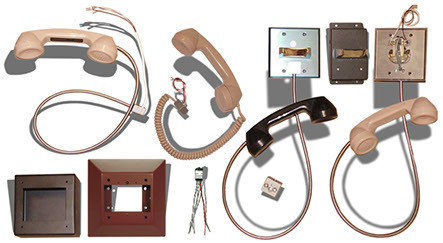 Factory assembled and tested intercom / paging control electronics packages are NEC 725 Compliant designed for use with a hardwired custom control panel. Use either momentary or maintained contact switches. A control panel kit is available that includes a 2.5" diameter speaker, electret microphone and volume control. The HC-0826 is a high quality, reliable, long life intercom amplifier, for use with the HC-0644, HC-0845, and HC-0846 intercom selectors. The amplifier is suitable for the high frequency use typically found in detention facility applications and may be used with any type selector module or relays. The inputs and outputs are connected to Phoenix type compression screw terminal plugs sized for 28 or 16 AWG stranded conductors. 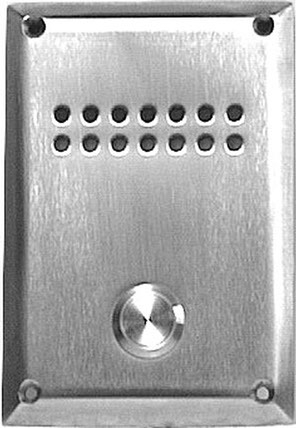 The HC-0644 Provides the functionality for eight (hardwired) remote intercom stations. Depressing a push button on an intercom station causes call-in to flash the associated LED, and activate an audio tone at the control panel. When station is selected, the panel LED becomes steady and the tone is silenced. A CCTV camera can be selected to display on a monitor. The HC-845 provides the functionality for 16 remote intercom stations, PLC or PC controlled. Panel or touchscreen indicators or display are as programmed. The HC-0846 proves the functionality for 8 remote intercom stations, shared with a second intercom amplifier, music input or sound alarm. 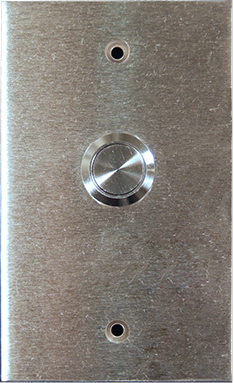 • COMPACT DESIGN - 2.75" X 4.25"
The HC-0654 provides audio threshold monitoring for eight intercom / paging channels. 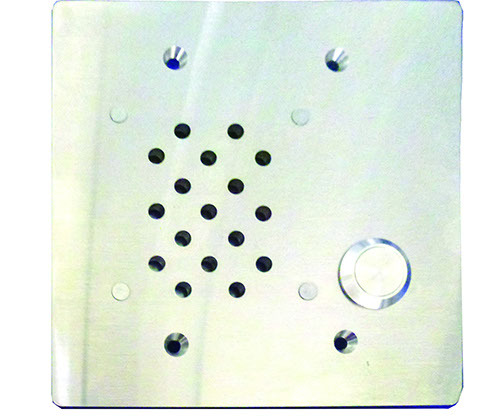 The TSS-1 intercom station is designed for use in the highest security areas. 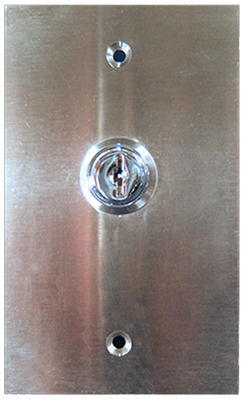 Its reduced width (3.5") makes it suited for installation in security hollow metal door and / or window frames. The JUST-TALK Duplex Talk Through Communicator is designed for visitation booths, control room to corridor, and other applications requiring communications through a security glass partition or wall. The system consists of a pair of identical units, typically one on either side of a viewing window or wall. Providing full duplex two-way communication without feedback. Each pair of units is tuned to the installed location environment. The result is very natural hands free communication. CP105 - 45 ohm speaker, electret microphone, 500 ohm volume potentiometer with knob. CP106 - 8 ohm speaker, electret microphone, 100 ohm volume potentiometer with knob. 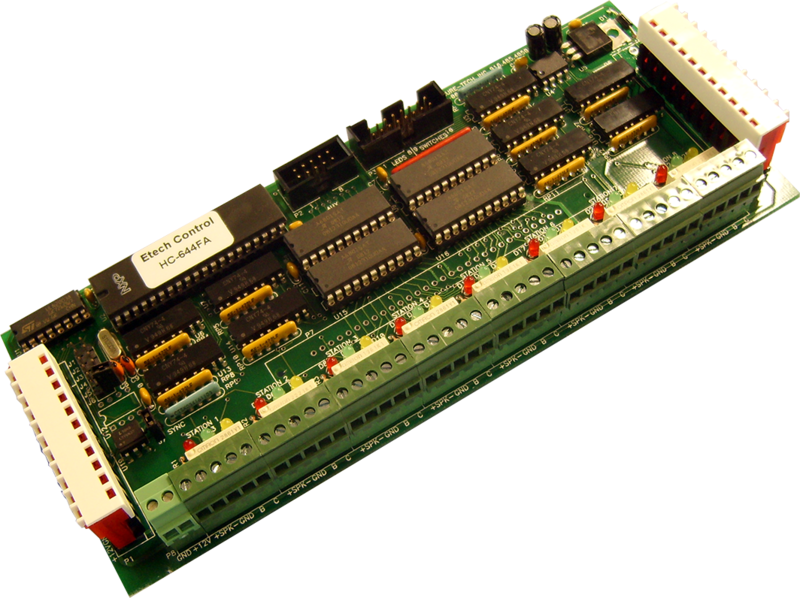 module typically connects or disconnects pay telephone audio lines, either by individual pairs or in 25 pair cable groups. Telephone companies require that both sides of the audio line be switched when selecting a line on or off. 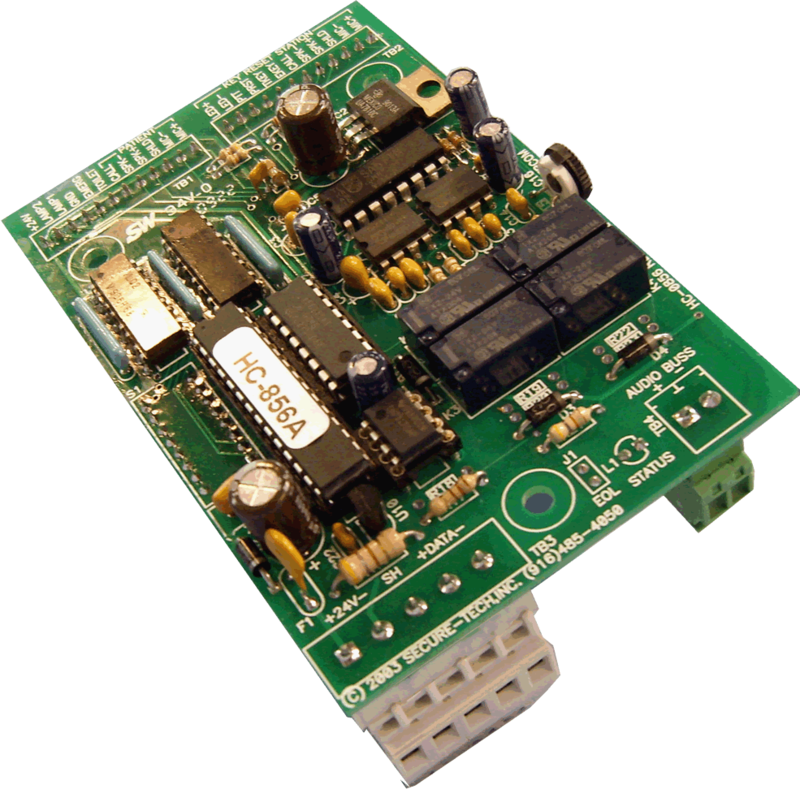 This product performs this switching function with a high quality two pole audio relay.(RVDC). Relays are 12 VDC. 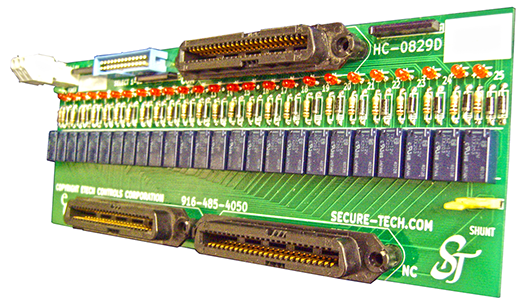 The HC-0829-SUP Telephone Disconnect Module with Supervision provides the ability to connect or disconnect telephone audio lines, either individually or in 25 pair cable groups. Telephone companies require that both sides of the audio line be switched when selecting a line on or off. This product performs this switching function with high quality two pole audio relays. 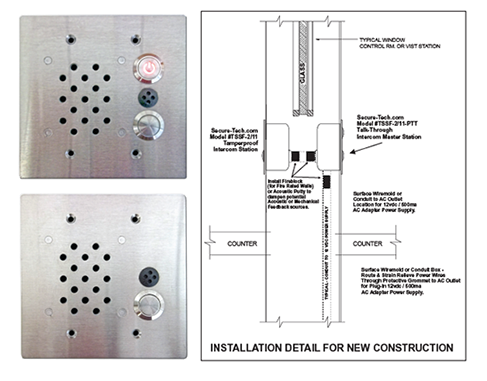 The Secure-Tech.com brand, "PTT" Series, Pharmacy Window Talk-Through Communicator, is a compact, high security 2-way Intercom System that is based upon heavyduty, detention grade 11 gauge Stainless Steel Staff and Master Station assemblies.